This week, our ‘Winery of the Week’ is Kulpmont Winery. Longtime friends John Motyka and Rich Chesney were two guys who had big dreams and always thinking about the next best thing that would launch them to stardom. Through the years, they had a number of conservations about different business ventures, but a winery was never one of them. That was until Motyka took a wine making class several years back and began making wine for his family and friends. As his techniques and knowledge of wine and horticulture enhanced, he subsequently began producing better wines that his friends and family frequently requested. “I was happy to give these bottles of wine away just to see the excitement of the people who enjoyed drinking them,” he said. Once Rich noticed the potential of Motyka’s winemaking ability, the next business venture idea came into his mind. However, this time, it wasn’t just fantasy. The two spent some time developing a sound business plan and in late 2015; they decided make the dream a reality. It wasn’t long before Kulpmont Winery was born. Located at 619 Scott Street in Kulpmont, PA, the family-run business has now been operating for nearly two full years. “We currently have our two families run the winery with zero employees. All the work is done with endless hours of dedicated family members,” said Motyka. 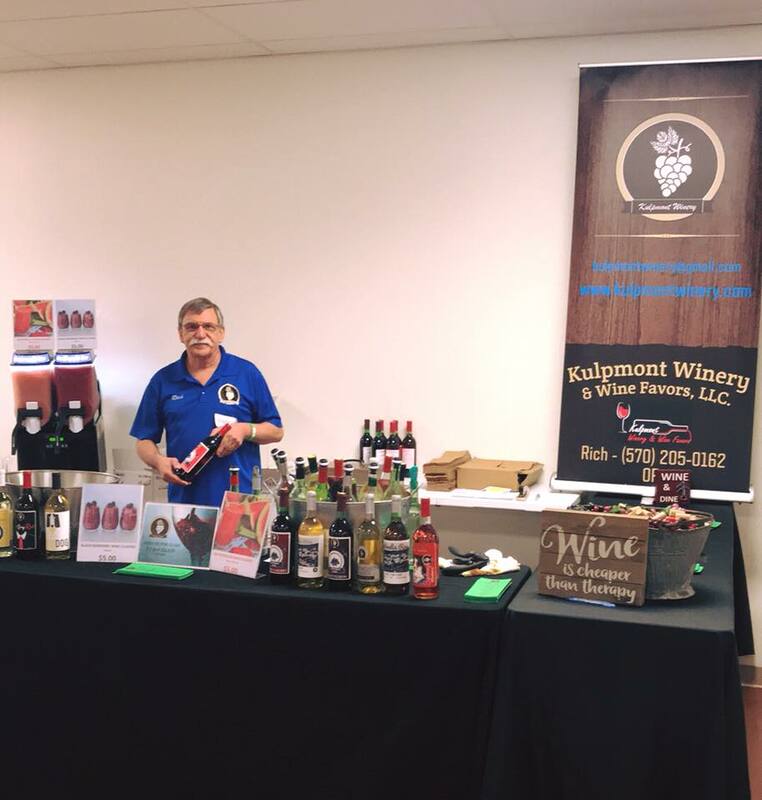 While it doesn’t presently have a vineyard to harvest grapes from, Kulpmont Winery does have access to the highest quality grape wine juice from several of the most popular grape growing regions in the world, says Motyka. 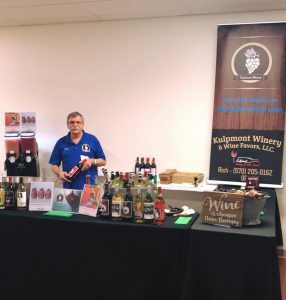 Being a fairly new winery in operation for about 19 months, Kulpmont Winery has yet to enter any of its wines in any competitions. However, the praise it has received from its customers is rewarding enough for Motyka and Chesney. Motyka said his top selling wine is the “Pop My Cherry” varietal, which is a cherry infused pinot noir. “It creates a pleasant aroma followed by a delightfully fruity taste,” he said. Other Kulpmont wines include a ruby merlot called “The Dark Side,” a Riesling known as “Apple of My Eye,” an “American Niagara,” as well as an extensive list of white and red table wines, and many more. The Kulpmont Winery crew was a big hit during its first year at the Wyalusing Valley Wine Festival and will return again in 2018 for the Sept. 15 event with some new concoctions. “We had a great time last year and wanted to surprise your attendees with some new wines while they get reacquainted with their old favorites. Not to mention, we’d like to showcase our wine slushies this year,” said Motyka.